Ok, so this isn’t the easiest dish to prepare, but it’s worth the trouble. This week, Blake Makes goes to China (if only in our imaginations), and we’re getting to know Far East food a little better with the help of our ambassador, Kylie Kwong. On page 270 in her cookbook, Simple Chinese Cooking, you’ll find the recipe for Prawn Wontons with Sichuan Chilli Oil. Bridget made the filling (below), and apart from having a lot of ingredients, the hardest part is assembling the wontons. 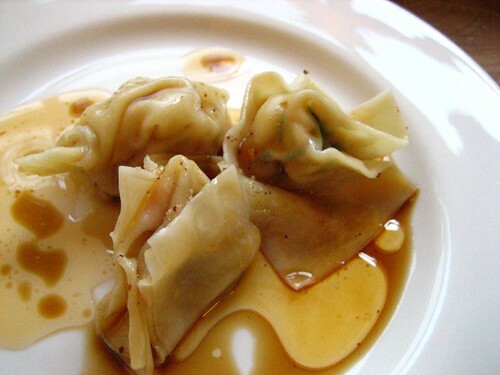 Just mix the filling ingredients together, chill them for 30 minutes, then spoon them in the wonton wrappers. You have to place a scant amount of the filling in the middle of the wonton wrapper, then wet the bottom half with water using your fingertips. Fold the wonton in half, sealing in the filling. Hold the wonton with both hands with the sealed edge up. 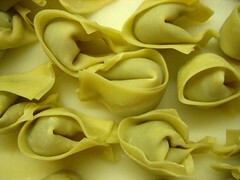 Flip the sealed edge back on the wonton (like trying to fold it in half), and then bring the two corners together. In the end, you’re sort of making what looks like a head wearing a bonnet. Boil the wontons just until the shrimp inside are cooked (just a few minutes). Top with the chili oil (below) and Szechuan Pepper and Salt. If you take this one on, it’s well worth it. There wasn’t a single wonton left. Hello, Blake Makers! Sorry I’ve been away. Blake Makes isn’t my day job (yet), so I apologize for being so busy at work. I’m getting back to my cooking/posting routine. Tonight’s plate: Spicy Shrimp Diavolo. After college, I worked for an Italian restaurant here in New Orleans. The most popular dish on the menu (and my personal favorite) was the Shrimp Diavolo. This recipe isn’t exactly as they prepared, which is ok since I like mine better. Plus, mine’s super easy to make. Heat 2 parts alfredo sauce to 1 part tomato sauce (you can use homemade or jarred, either works). Add red pepper flakes until the dish reaches your desired level of pyro. 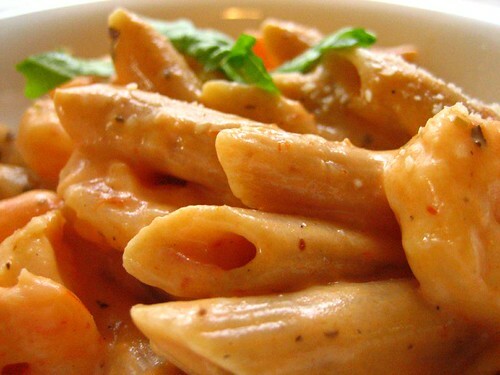 Cook some Penne until al dente (we use whole wheat) and then spoon it right into the sauce. You’ll want some of the pasta water to make the sauce velvety and rich. I toss in about 10 cooked shrimp and finish with Parm. I’ve done variations of this meal with mushrooms and roasted red peppers. It’s a hot little number.